Sync files in real time across linked devices and share them with anyone you wish! "All of the data is encrypted client-side using 256-bit AES encryption with an optional private key, unusual security feature for syncing services." File Sync in IDrive is similar to a folder you carry in your flash drive everywhere, except for the fact that there is no flash drive! You will have access to your most critical data from any device, in a form as if it is on your local drive, and on your IDrive account. The moment you modify files, the updates sync to the local drive of computers on which Sync is enabled and to your cloud account; thus you can instantly access the latest version of your files locally, via web browser, and using mobile apps too! Sync storage does not impact your backup storage. Sync storage limit matches your backup storage limits. How to keep files in Sync? You need to activate Sync in your IDrive account just once – via desktop app, mobile app or web browser. 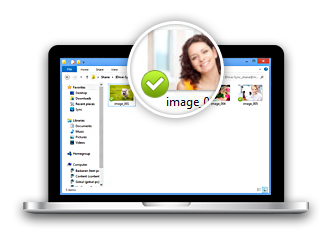 Thereafter, you can easily access and sync files from anywhere! Although your mobile apps and web account are always in sync, you can always link only those computers on which you wish to keep files in sync, by enabling Sync on the desktop app. On the Sync tab of the IDrive desktop app, click 'Activate Sync', and then click 'Proceed'. Sync gets activated in your account and links the particular computer. IDrive creates a unique local folder on the computer. Add files to this folder to sync them in real time. Whenever you modify files within this folder, the updates instantly reflect on all linked devices and vice-versa. On the Home screen of mobile app, tap on 'Sync', and then tap on 'Enable Sync'. Use your mobile to sync new files to all the linked devices. Access the files synced from PC, Mac, or via the web. You can also select some synced files for offline access. Log into IDrive.com, and on the Sync tab, click 'Enable Sync'. Upload or simply drag-and-drop files to sync them. Also, view, download and share files synced from elsewhere. Access the recently deleted synced files from Sync's Trash. Easily share any number of synced files with anyone you wish via email. You can share synced files from your computer, mobile device or via the web with your friends or associates for collaborative access. Once you login to IDrive.com, you will find that all the backed up and synced files shared by you are listed in the 'Shared by Me' tab. You can view the shared files, edit their access rights, and even discontinue sharing them. * Important note on Sync: Usage of Sync functionality requires a separate activation. 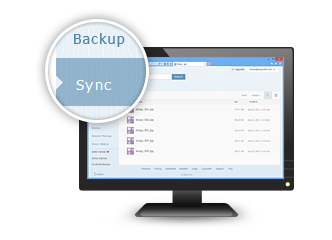 Sync is a separate service distinct from cloud backup. Sync functionality can be activated from the desktop or the Web application. A feature of IDrive, which links all of your devices such that the content on all the devices and in your cloud account are always in sync! Whenever you modify the synced files, the updates are instantly available on all the linked devices and in your IDrive account! 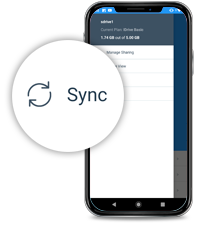 IDrive offers you sync storage space – equivalent to your IDrive plan, to assist you with the extra space needed for keeping your significant files in sync! You need to activate Sync in your IDrive account just once, and thereafter it shall remain active throughout! On the Sync tab of your IDrive desktop app, click ‘Activate Sync’, and then click ‘Proceed’! On the Home screen of your mobile app, tap on ‘Sync’ and then tap on ‘Enable Sync’. Simply log into your IDrive account, go to the Sync tab, and click ‘Enable Sync’. 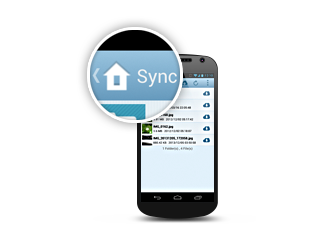 Once Sync is activated, your mobile devices and your cloud account are linked forever! However, you can link computers selectively – by enabling or disabling Sync from the desktop application. From the desktop app, ‘Enable Sync’ to link the particular computer. By default, a Sync folder is created on your computer. Simply drag-and-drop to add files to this folder and sync them in real time! Even the files synced from elsewhere instantly appear in that folder – until you ‘Disable Sync’ on the computer! 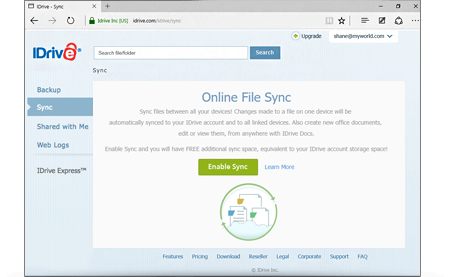 You can instantly access the latest version of your synced files from any linked device or IDrive.com! Access the Sync folder on linked computers to view, share, add, delete or modify the synced files. Also retrieve up to 30 previous versions of the synced files! On the Home screen of IDrive mobile app tap on 'Sync' to view, share, delete, or sync new files to linked devices. You can also select files for offline access! Log into IDrive.com, and from the Sync tab – view, download, share, or sync new files with ease! Access the recently deleted sync files from Sync's Trash! Sync your files in real time across all linked devices. Sync frequently used files and access them anywhere! Backup files from all of your PCs, Macs and even mapped drives into a single account. Backup contacts, photos, videos from your iOS and Android mobile devices.